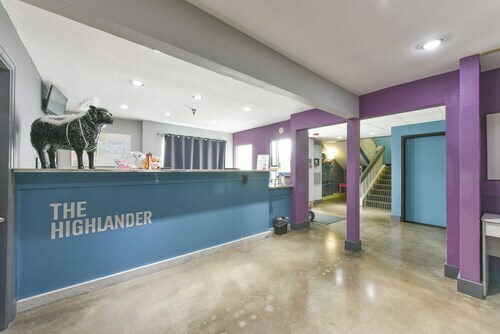 Located in the middle of downtown, this Austin hotel is one block from the 6th Street entertainment district, 5 blocks from the convention center, and 6 blocks from the State Capitol. Located in Downtown Austin, this hotel is within a 10-minute walk of Sixth Street and Paramount Theater. Texas State Capitol and Austin Convention Center are also within 15 minutes. Downtown Station is 9 minutes by foot and Plaza Saltillo Station is 20 minutes. This 16-story Austin Downtown hotel is adjacent to Lady Bird Lake, steps away from the South Congress Avenue and 6 blocks from Sixth Street, where live music, choice restaurants, and quaint shops abound. Less 1 mile from Austin Convention Center. This 14-story Omni hotel in Austin's busy high-tech corridor is popular with corporate travelers, offering extensive conference facilities and wireless Internet access. 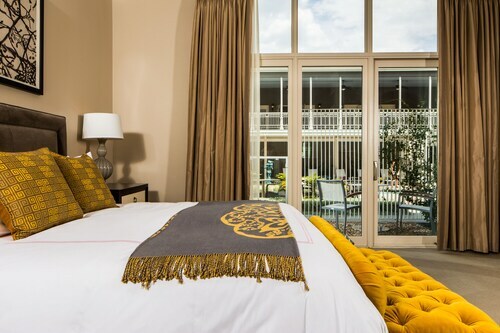 Situated in Austin, this boutique hotel is within 3 mi (5 km) of Hyde Park Theatre, Thinkery, and St. David's Medical Center. Northwest Recreation Center and Texas Memorial Museum are also within 3 mi (5 km). Highland Station is 13 minutes by foot and Crestview Station is 28 minutes. 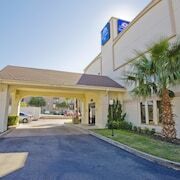 Located in the heart of Austin, this hotel is within 6 mi (10 km) of J. J. Pickle Research Campus, North Cross Mall, and Norris Conference Centers. Thinkery and St. David's Medical Center are also within 6 mi (10 km). 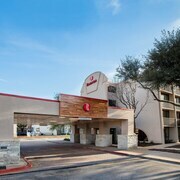 Located in East Austin, this motel is within a 15-minute walk of Frank Erwin Center and Sixth Street. Texas State Capitol and Austin Convention Center are also within 1 mi (2 km). Downtown Station is 19 minutes by foot and Plaza Saltillo Station is 20 minutes. 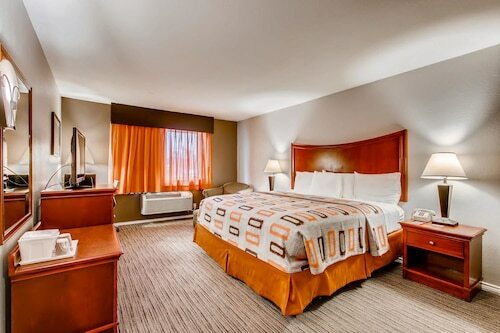 Red Roof Inn PLUS+ Austin South offers a budget-friendly stay on highway I-35, a 20-minute drive from vibrant downtown Austin. Guests who prefer nature to nightlife can drive 15 minutes to McKinney Falls State Park. 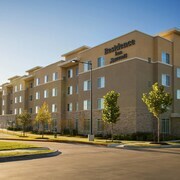 Austin-Bergstrom International Airport is a 15-minute drive from the hotel. Situated in Austin, this luxury hotel is 0.8 mi (1.3 km) from Village at Westlake and within 3 mi (5 km) of Lake Austin and One World Theatre. Lost Creek Country Club and Barton Square Mall are also within 6 mi (10 km). Located in Downtown Austin, this luxury hotel is within 1 mi (2 km) of Bob Bullock Texas State History Museum, Texas State Capitol, and University of Texas at Austin. Sixth Street and Frank Erwin Center are also within 1 mi (2 km). Austin Station is 28 minutes by foot. Facing Lady Bird Lake, this business-district hotel is a 5-minute walk from Congress Avenue shops, nightlife, and restaurants. The well-known 6th Street entertainment district is nearby. The Congress Avenue Bridge, home to the famous bat colony, is a 10-minute walk. Situated on the waterfront, this luxury bed & breakfast is 1.5 mi (2.3 km) from Hippie Hollow and 2 mi (3.2 km) from Windy Point Park. Tom Hughes Park and Volente Beach Water Park are also within 9 mi (15 km). How Much is a Hotel Room in Austin? 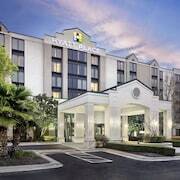 Hotels in Austin start at $45 per night. Prices and availability subject to change. Additional terms may apply. You don’t have to be a twenty-something hipster to enjoy a vacation in Austin, Texas. Sure, the city is an attractive destination for discerning audiophiles, aspiring foodies, and nature enthusiasts. But, there is no age-limit on the opportunities for excitement in Austin. The self-proclaimed (and widely accepted) Live Music Capital of the World has a stage for every sound, a food-truck for every taste, and an outdoor space for every activity. Aside from fall Saturday afternoons when the Darrell K. Royal-Texas Memorial Stadium is packed with roaring University of Texas students, clad in burnt orange and white for their beloved Longhorns, the most popular event in the city is the annual SXSW (South by Southwest) Conference and Festival that brings musical acts of all genres, emerging technology thought leaders, and multiple media outlets together for a week of cutting edge fun. That same diversity is on display around every street corner in the Texas state capital where Converse are just as popular as cowboy boots. 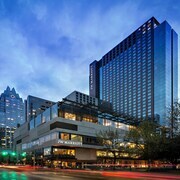 Let Travelocity help you find a great deal on one of the many amazing hotels in Austin, TX. You’ll pocket enough money to enjoy a proper self-guided culinary tour of every food truck in town. Where are the Best Places to Stay in Austin? For a front row seat on the weirdness that defines Austin, we recommend a stay at a hotel in the South Congress (SoCo) section of South Austin. The city’s true character is on display in this eclectic neighborhood (to say the least) in the form of vintage art galleries, trendy boutiques, and open-air music venues. Let your freak flag fly all day and all night. 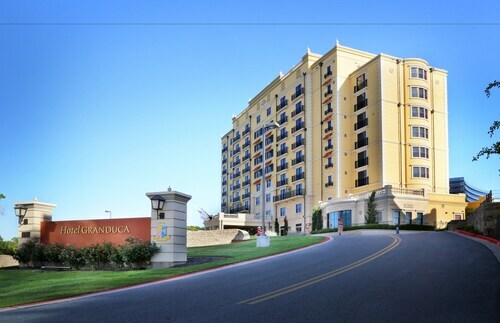 Wyndham Garden Hotel – A short drive from Austin-Bergstrom International Airport (AUS) and a short walk from the fun in South Congress, the Wyndham Garden offers a convenient location for exploring the area. The on-site hot tub, fitness center, and outdoor pool are awesome amenities. But, it’s pretty tough to beat a customizable burger with over 12,000 flavor combinations from the hotel’s ReVive! restaurant. 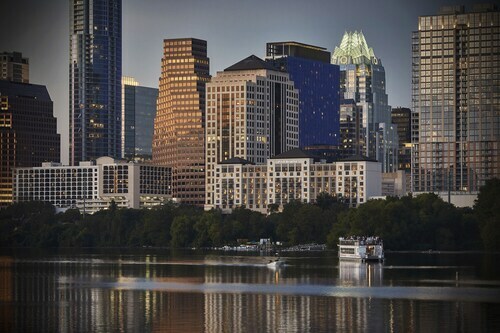 Like any typical capital city central district, downtown Austin is home to a fast-paced business and government hub. The beehive of commerce turns into a swarm of revelers come sundown, as the offices close down and the bars and entertainment venues along Sixth Street open up. The Omni Austin Hotel – Elegant, sophisticated, and contemporary, the Omni is attractive to business travelers and vacationers, alike. Midway between the convention center and state capital—and offering a 24-hour business center and free Wi-Fi—the hotel is primed for you to get work done. And, just a block from Sixth Street, the Omni plugs you into the life of the party, too. Nestled along the Lady Bird Lake section of the Colorado River between downtown and South Congress, the Rainey Street Historical District is a perfect mix of the two. Craftsman homes in the shadows of the Austin Convention Center have been converted into bars, with yards that now serve as beer gardens. Grab a bike from a fusion food truck on your way to your industry event on the convention floor. 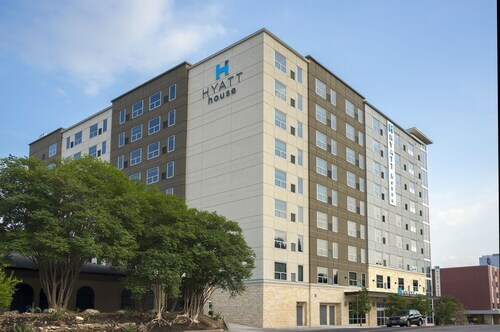 Hilton Austin – Talk about the best of both worlds, the Hilton is one block south of Sixth Street’s excitement, and just across the street from the Austin Convention Center. 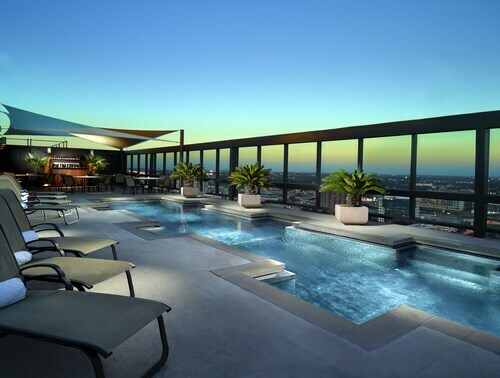 After a day at your industry event across the street, unwind with a dip in the rooftop lap pool, have a drink or meal at the Liberty Tavern of Finn & Porter, then hit the town for an intimate show at one of Austin’s popular music venues. One of the premier locales for Austin lodging has to be the laidback neighborhood of Bouldin. Located just west of South Congress and across the Colorado from downtown, Bouldin is central to all. You can be at the convention center, University of Texas, or capital building in a matter of minutes. And—perhaps more importantly—the bars and restaurants on Rainey and Sixth Street are a short cab ride away. Hyatt Regency – Dress up for a night at the symphony at the Long Center for the Performing Arts, or take a laidback approach with a community concert on the grass at the Auditorium Shores at Town Lake—both just outside the Hyatt’s front doors. Enjoy a delicious meal with a breathtaking city view at the Marker 10 restaurant, then retire to your stylish guestroom for a restful night’s sleep on the triple-sheeted Hyatt Grand Bed. 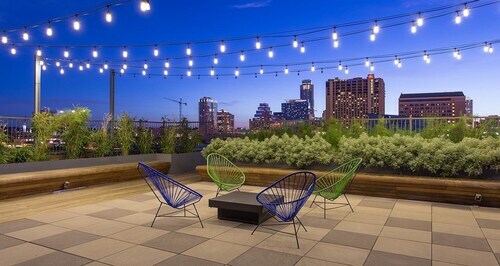 When you use Travelocity to book your stay in the Live Music Capital of the World, you’ll be able to choose from a huge selection of accommodations, ranging from cheap hotels in Austin’s top neighborhoods to upscale resorts throughout the area. Plus, with the money you save thanks to Travelocity’s Austin hotel deals, you can buy a round of local craft beers for the young whippersnappers around you and show them that a wise wanderer like yourself can appreciate the finer things in life without having to be ironic about it. Need insider tips on must-see attractions in Austin? Check out our Austin travel guide! Staff here are great. Very clean and safe. Just a short distance from downtown and very economical. 3 days ago by A verified traveler from Forest va.
TVs would not get a signal after first night, showerhead was broken and spraying up over the top of the curtain, soaking the floor, wall and toilet. I brought this to their attention on the morning of Day 2, at it was never fixed. Vertical blinds in living area would not turn or open. Also brought this to their attention and was not fixed during my stay. The staff was wonderful! Everyone I was in contact with made our stay great. I was staying one night with my young son. They offered to put me close to the lobby on a higher floor so they were close by. I took the offer and it made me feel much safer. Dinner and breakfast were provided so we didn't have to get out. We just got some food, rest and continued with our trip. Fairmont is always a joy to stay at. Service is incredible.